My favorite restaurant served the worst meal of my life. Now I'm torn. The greatest sushi I’ve ever had came from an unnamed restaurant here in Chicago. It was a neighborhood spot, at the edge of a hot neighborhood, but at the time it was still off-the-radar. A friend first told me about it, and I started going there with my then-boyfriend, now-husband. The sushi chef behind the bar wasn’t a head-down kind of guy; he was always ready to engage with customers. You could just tell the chef what sort of mood you were in, and he would bring out something that always managed to hit the spot. He was also inventive, so that his off-the-menu rolls would include flavors I’d never really had in sushi before, like oregano, or strawberries. I was a sushi novice who’d started out on California rolls, so his innovations—you can argue its authenticity—straight-up thrilled me. They were surprising as well as personalized. It became a special date-night place for my husband and me. Then something happened and I never went back. What would it take for you to write off a favorite restaurant? Food poisoning? A rude server? Less-than-stellar food? Mine wasn’t any of those, it was entirely preventable: negligence. I had long, never-ending night that added up to my overall worst restaurant experience. So I walked out that evening and never went back, but let’s face it, I’m really only hurting myself. It’s extremely doubtful that the restaurant staff ever noticed my absence, so what kind of point am I making exactly? I am lucky to live in a city with countless options for great food. Let’s say that I didn’t, and a restaurant I had special emotional attachment would, well, betray me? Could I swear it off like a bad breakup? But what if I still had... feelings? Here’s what happened: When my friend Christy was coming to visit from New York and wanted to go to dinner, this sushi restaurant was the first place I thought of. I always host a slight feeling of inadequacy when a New Yorker visits Chicago, and I wanted her to have an amazing experience that she couldn’t get anywhere else. Our table was eight people total. We had brought five bottles of wine, as the place was BYO. Then we settled in and ordered edamame and several sushi rolls. It was a Friday night, so the place was super-busy, and I’m not sure if they were understaffed that night. But our back-room Siberia seemed to be a place where the server and manager could just conveniently forget about us, for extremely long stretches of time. It took a half-hour for the edamame to arrive. If the fried tofu or grilled beef skewers come out late, that’s one thing. Edamame involves taking the pods out of a fridge. By this time, it was after 8 p.m., and we were starving. We also were starting to go through our wine pretty quickly. Rolls would finally come out, one at a time, with long stretches between them. The excellence of the sushi—and it was excellent—was negated by how little there was and how long everything was taking. Here’s a joke that was made about a million times that night: Why is this taking so long? It’s not even being cooked, it’s being formed! Soon, we had finished off all five bottles of wine. When a single sushi roll would finally arrive, we swept down on it hungrily, only allotting one piece per person, like we were rationing food on a desert island. Maybe it was the wine, but I felt like I was in that Buñuel movie where everyone’s trapped in a dinner party and we were never going to get out of that awful, fluorescent-lit back room, ever. The staff remained steadfastly indifferent to our plight. If we saw them (a rarity), they glared at us, instead of the other way around. I am well-aware that if this is the most awful meal I’ve had at a restaurant, I have been beyond fortunate. No one got into a fight or got sick. I have worked in food service and know how difficult it is. So I’m usually the kind of patron that usually hunts down the manager to give my server a compliment after a restaurant meal—I don’t know how much that helps them exactly, but I always figure that it can’t hurt. I do not consider myself a complainy person (although my husband may disagree). So I found this episode—having the worst meal experience of my life in a place I dearly loved—particularly upsetting, especially since I had brought someone there I was hoping to impress! Ha. After three hours we finally called it, cancelling the rolls yet to be served. I hunted down the manager for the second or third time—our server by that point was like a legend we’d once heard about in childhood—to get the bill, and cancelled the several rolls that had yet to be served. Adding insult to injury, the bill arrived with the entire meal charged. The final tally: one bowl of edamame, three sushi rolls for eight people. Three hours. The dinner was hardly the culinary spectacle I had hoped for my friend—I think my meal that night wound up being a pizza we ordered at the bar. Most of us were just shell-shocked. The next day, some of them joined Yelp for the first time, just to comment on our horrible time there. I didn’t, though. 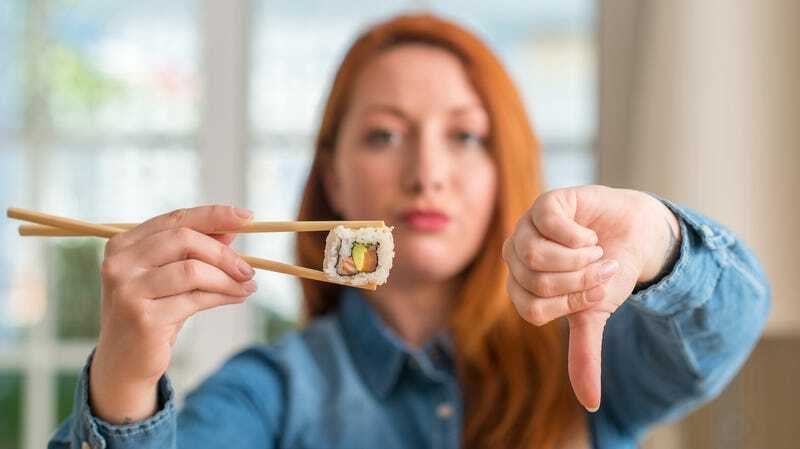 The worst part of it was that evening marked the end of my relationship with what was once my favorite sushi restaurant. I just couldn’t go back there, nursing a healthy degree of resentment. The only emotion I could assign was betrayal. I had loved the restaurant dearly, we had good times together, and then it fucked up big time—with seemingly no remorse. Curious, I checked Yelp for reviews. It was like Googling someone’s dating profile and realizing the person was a Casanova at first, before scorching the earth and leaving a trail of exes scorned. Many five-star reviews for the amazing food was offset by many one-star reviews for bad service. Therein lies the push and pull in my mind. The food was amazing. My memories were so happy—except one. As I said, I live in a place overflowing with great restaurants that didn’t give me the worst night out ever. I have since dined at places just as satisfying. And yet, sometimes I daydream about what I’d do to experience that sushi chef’s creativity again. In the end, there’s a very defined line in the sand: On one side, I could grin and bear it and give that place another shot. On the other side, I could swear it off forever and not look back. The problem is looking down, I’m straddling the line right down the middle.